Okay, so I promised you the story of how overnight curbside parking became legal in New York City, as reported in the archives of the New York Times. Let's begin in 1947, when reporter Bert Pierce declared an "acute space shortage" for the city's 750,000 passenger cars. Many garages were converted to commercial spaces during World War II, and many parking lots were built on during the postwar boom. My guess is that the garage owners were charging as much as they could, but at those rates it was just more lucrative to use the land for housing or shops than for garages. At that time, the legal thing to do if you owned a car was to rent overnight space in a garage, which cost roughly $20-35 dollars per month. If you paid more, the garage would send a valet to pick up the car in the evening and drop it off again in time for you to go to work in the morning. Some people could afford cars, but didn't want to pay for a garage space, so they tried to park illegally. Sometimes they were ticketed, but more often they got away with it, because the police simply didn't have enough officers on patrol at night. In April 1947, the Times's Joseph Ingraham reported that a "confidential telephone command" had gone out to all police precincts directing them to only ticket cars that were parking hydrants or otherwise causing unusual hazards. When news of the order became public, however, Police Commissioner Wallander (not the fictional Swedish detective) immediately denied that it had come from his office, and declared "I am opposed to overnight parking and summonses will be issued as before." It wasn't just individual car owners that were parking on the street. 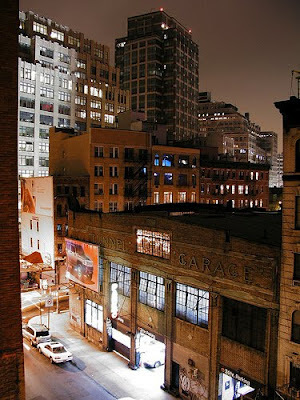 The Automobile Club of New York and several politicians claimed that parking garage staff would charge customers to park their cars, and then turn around and put the cars on the street. Charles Wolf, a skin care specialist, testified to the City Council in June that the garages had a deal with the police. "The license plate, which is supposed to be a holy piece of metal with nothing on it but what is assigned by the Motor Vehicle Bureau, has in certain areas an insignia in the form of a circle, white or red, and that car is not touched when parked overnight. Why? I will leave that to your imagination." Buses or trains on the Northeast Corridor? What does mode shift look like? What is New York's Forest Hill?